‘The List’ of restaurants seems to be never ending and it takes quite some time for us to actually get to restaurants on the list. We finally got to Restaurant Balzac in June and wished we’d got there so much earlier as it wasn’t long after our first visit that chef/owner Matthew Kemp announced he was closing Balzac and opening a more casual restaurant and bar on the same site. This news saw us book in one last visit to Balzac before it closed. 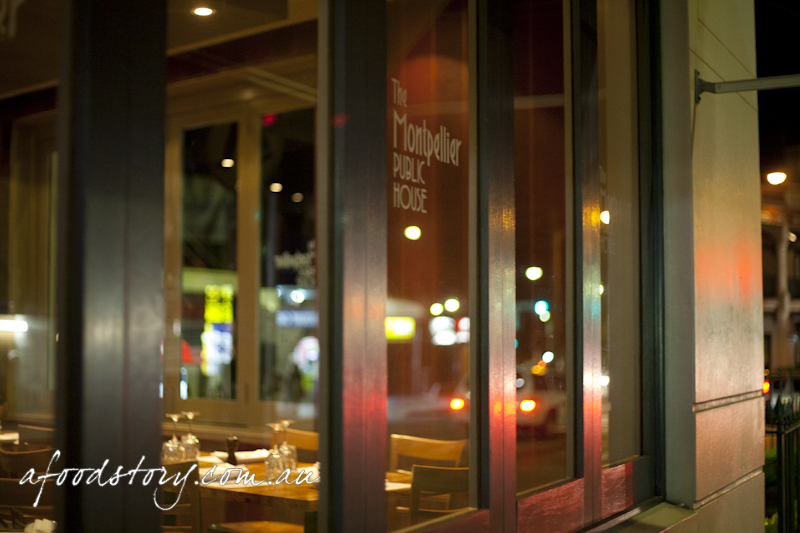 We were eager to see how The Montpellier Public House would stack up, so we booked in for dinner on the restaurant’s second night of service. The boys started with beers downstairs while I finished work. Luckily I’d planned my day well and got into the office at 7am to ensure I could get out ‘on time’ (yep that’s right advertising is totally glamorous). Em and I arrived after the boys had downed a few beers and we joined them for a drink at the bar. Em and I shared a 500mL Henney’s Dry Cider which I found to be quite earthy in aroma and with a bittersweet apple flavour. Then it was time to relocate to the dining room upstairs. 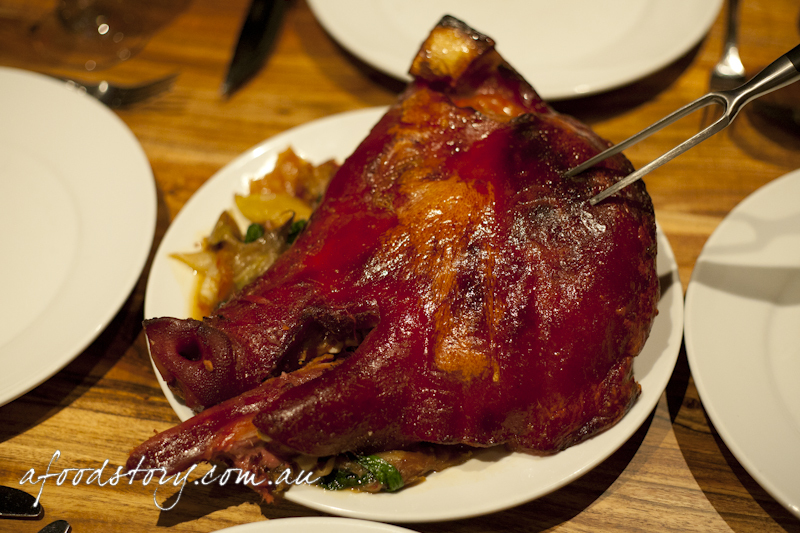 Warning: This blog post contains imagery of a cooked pig’s head. Some people may find the imagery disturbing. Our main waitress for the evening, Lola, immediately made us feel at home. Lola’s enthusiasm about the new menu rubbed off on us and once she’d run through a few of the options we were well and truly pumped. The hardest part was deciding what to have and what to leave on the ‘coming back for’ list. Though not a fine dining establishment anymore we still received complimentary bread, which is always welcomed by hungry diners while deciding what to order. Presented with a selection of white and soy and lin, it’s funny how you know exactly who will end up with each variety. Em has issues with grains so she went for the white, Dylan stole the last white and Mr O and I dug in to the soy and lin. The bread was a nice touch but not as delectable as the warm rolls we had the first time at Balzac. 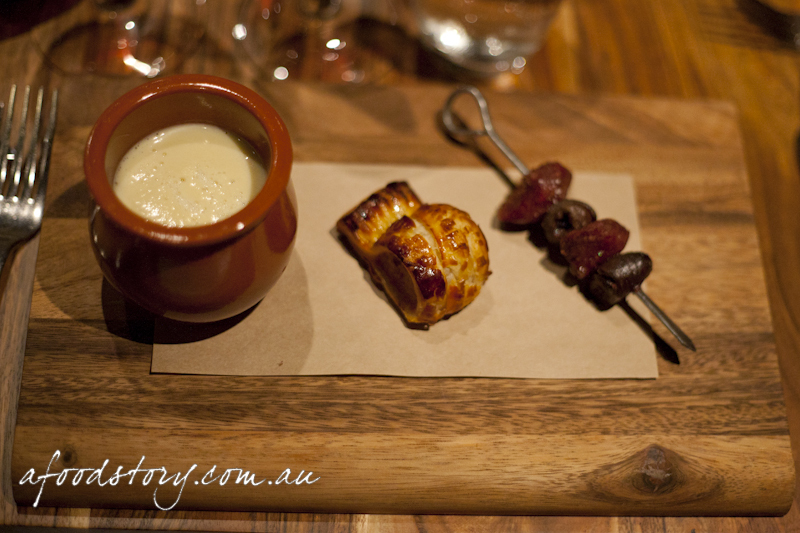 White onion and garlic soup, duck sausage roll, duck heart and gizzard kebab ($20.00). There were so many delicious sounding entrées on the menu but I just had to stick with my gut instinct, the soup. I was rewarded with one of the most gorgeous soups ever, really creamy, buttery garlic soup with a silky consistency and slight foam on top. Em and I just loved the mini pottery ‘cauldrons’ as Em dubbed them. The sausage roll had uber crispy flaky pastry and tender juicy innards of duck meat. 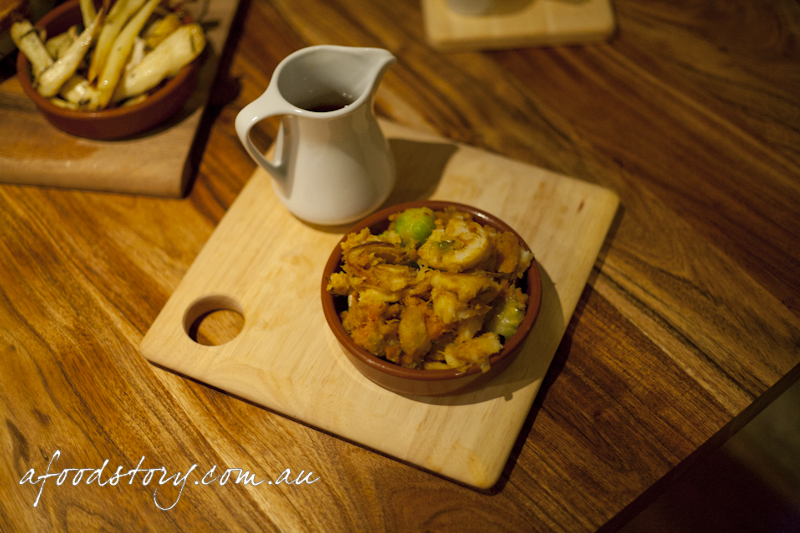 The kebab was the part of the dish I was most unsure about – duck hearts and gizzards?! Well my sub-conscious got to work and I accidentally flung one of the gizzard pieces across the floor… oops! The gizzard I did have was quite firm, not fibrous like other parts of meat and surprisingly mild. The duck heart was tender and full of flavour. An awesome entrée. 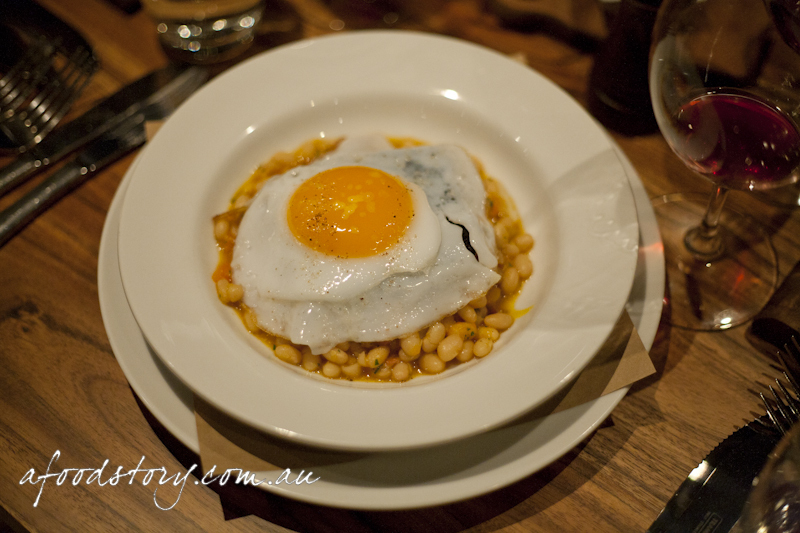 Fried duck egg, black pudding and baked beans ($18.00). I really don’t like baked beans but thought I would try this dish as I’ve never had the real deal before. I don’t know what happens to beans when they get baked but I just can’t do it. And black pudding again is just not for me – luckily this was not my entrée. Both Dylan and Mr O really enjoyed this though the portion size was absolutely massive and more of a main meal than a starter. Pot roasted pigs head and cider, kale, bubble and squeak ($48.00 for two). Wow! An impressive sight. As soon as Lola described the pig I knew we had to order it. 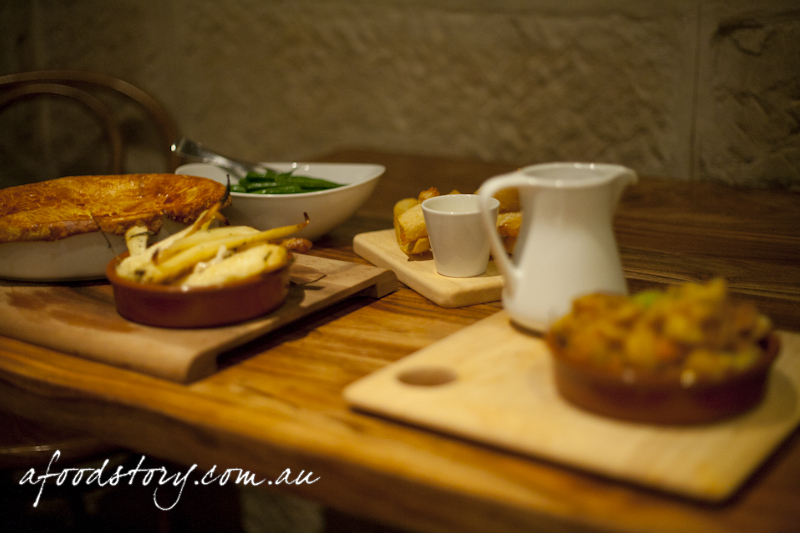 It didn’t take too much convincing to settle on the pig and pie for mains between the four of us. Mr O took the carving honours and portioned out the cheek meat which was juicy and tender. Tasting the pig’s tongue, I can best describe it as resembling silverside. Mr O had an unfortunate encounter with a little tooth in his piece of tongue. Eww! But also very funny when it doesn’t happen to you! The kale and onions were nice and refreshing. And the additional accompaniments of bubble and squeak went really well; with the nutty, tender yet firm brussel sprouts, potato and other veggies balancing the richness of the pork. I think I overdosed on the pig and ate a little too much of the fatty layer hidden between the crackling and meat. We couldn’t finish this little piggy, try as we might. I did dare someone to eat the pig’s eye but funnily enough there were no takers. 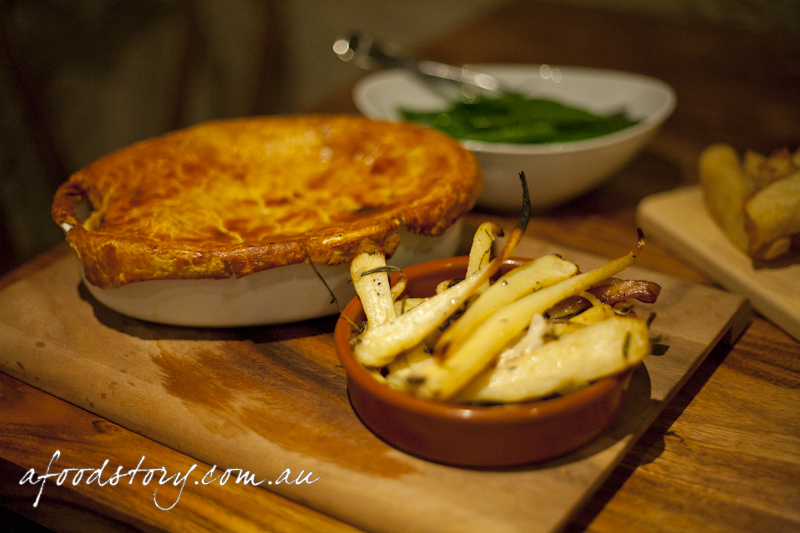 Wild hare and chestnut pie, roasted parsnips with honey and thyme ($44.00 for two). Following the pig we were all struggling, but we still had our other table of food to get through! The pig’s head took up the entire table we were seated at, so the waitstaff kindly brought over a second table for our other main and sides. We thought it was a fun novelty, but I think they might need to rework the table seating in the near future. I pushed the full factor aside for the pie I’d wanted to try all night. I loved the pie filling of hare and chestnut but wished it had a fluffy puff pastry topping instead of short pastry. Sure the pastry had its own merits but I just wanted some fluffy puff to mop up the sauce from the pie, and a richer, more gravy-like sauce would have been just gorgeous. Parsnips are a veg I didn’t really grow up with but I wish I had, the combination of rosemary and sweetness from honey were just perfect. Oh and I might be going crazy (or I drank too much wine!) but I am sure the parsnips were roasted with rosemary, not thyme as the menu outlines. Either way, the parsnips were delicious. The perfect accompaniment to the rich mains, the beans cut through and kept our arteries from clogging up. 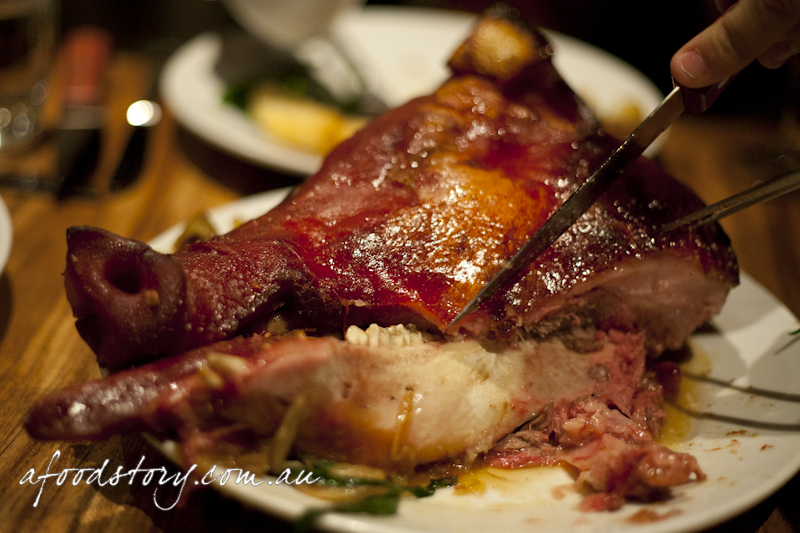 Definitely a side to consider if ordering the pig’s head. 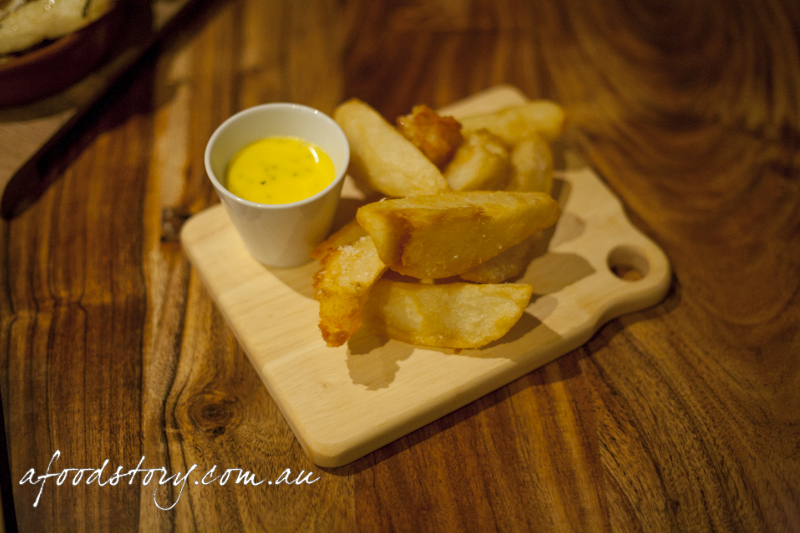 Hand cut chips with béarnaise ($8.00). Sooo much food! Crispy, fluffy, extremely delicious chips but just too much food – we didn’t really need the chips with all the accompaniments that came with our mains. I didn’t eat the sauce and I don’t do sauces but from what the others have told me, the chips actually didn’t need the sauce at all. Mr O and I apparently need to go on a diet as our sundaes didn’t arrive, sad face. We assumed they were only moments behind the other two desserts but when Dylan and Em were almost finished we realised they had been forgotten. Mr O chased them up and with an apology they were at our table in a jiffy. Chocolate forgives all! Chocolate shavings on top just melted in the mouth and hid the mountain of deliciousness underneath. Loved the ice cream and totally love love loved the brownies but wish they were more bite-sized as they were a little too big for a mouthful. And some sort of choc fudge sauce at the base was thick and delicious. Macadamias brought a nice break to the chocolate madness. Pure evil goodness. But… I struggled. Maybe it was the copious amount of food I had already consumed but I was just craving a scoop of vanilla to cut through the chocolate. And I can’t believe I just said that. 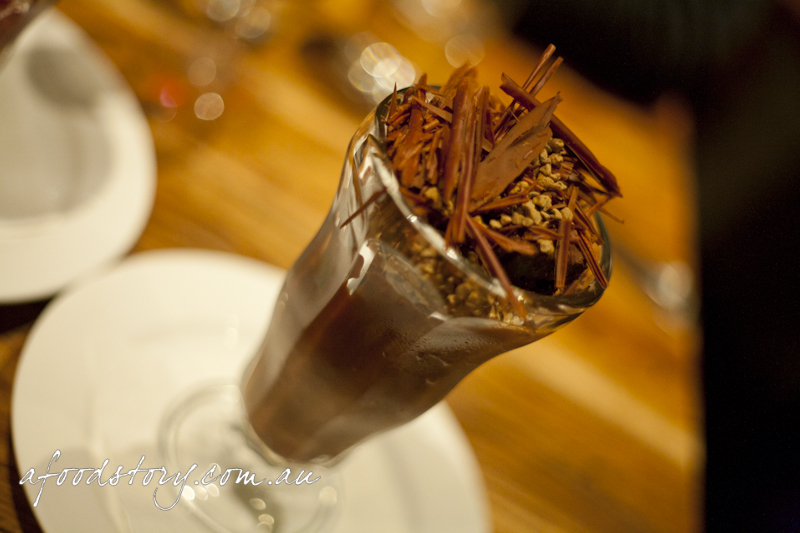 Chocolate sundae, I surrendered first time around but I will be back for another battle. I only had a very small taste of Em’s dessert but I loved the praline and the fresh, sweet strawberry ice cream. Em found it all too sweet but she doesn’t have much of a sweet tooth, so I might just have to order this next time to decide for myself. Went back on Friday night and had the lamb shoulder and apple crumble with salted caramel ice cream. The lamb shoulder was tender and juicy and I would definitely order it again. The apple crumble was really good but let down by the portion size. One of my favourite things about apple crumble and ice cream is the hot/cold contrast. There was way too much crumble and no where near enough ice cream. Just need to work on the portions a touch and it would be perfect. Also got to try the potted river trout with soda bread and pickled cucumbers. Have to say it gives the soup a run for it’s money as the best entree. Finally, the cheese selection is sensational. Got stuck into it as well on Friday. I would almost go back for cheese and wine alone. 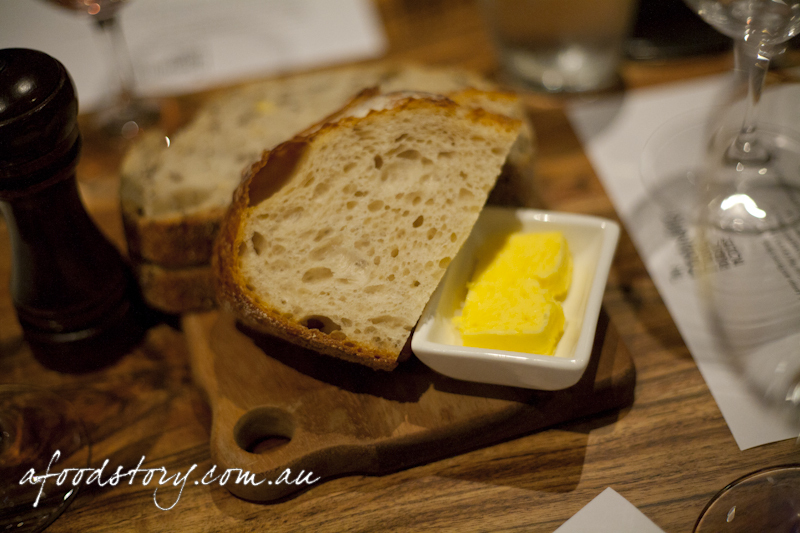 I’m keen to try the cheese too, the cheese board/selection thingy looked soooo amazing! Oooh I’d been waiting for a picture of the Knickerbocker glory! The dining room is gorgeous, I love the wooden tables. I’m a fan of dipping chips into a sauce like béarnaise – delicious! Wow – definitely some interesting dishes! Can’t wait to check it out. If I get this place I’m viewing tonight I’ll be approximately 20 metres closer! Think I might have to drop in on my way home from the inspection for dinner in the bar. The fish & chips with mushy peas sounds like me. Haha Mr O… does the 20m really make any difference? 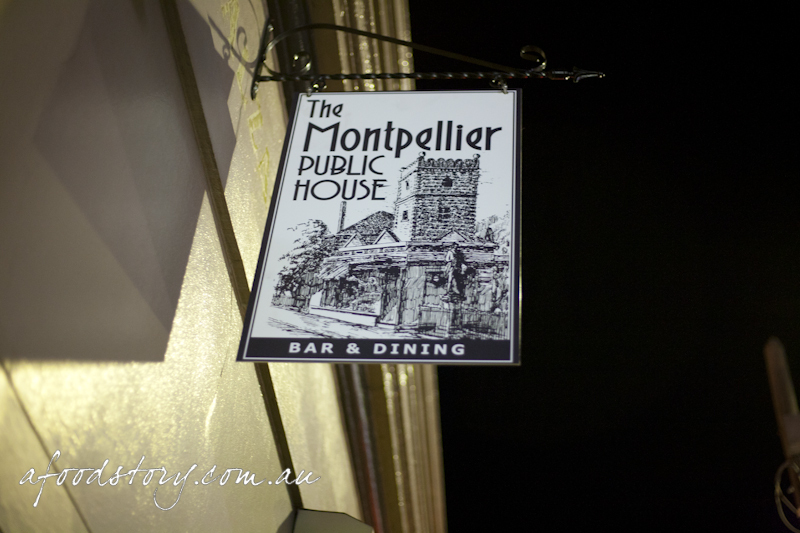 Good food and beer should negate that easily… so if you get the place is the house warming at The Montpellier Public House? Nice food, though I wouldn’t go crazy over it, but *terrible* service. 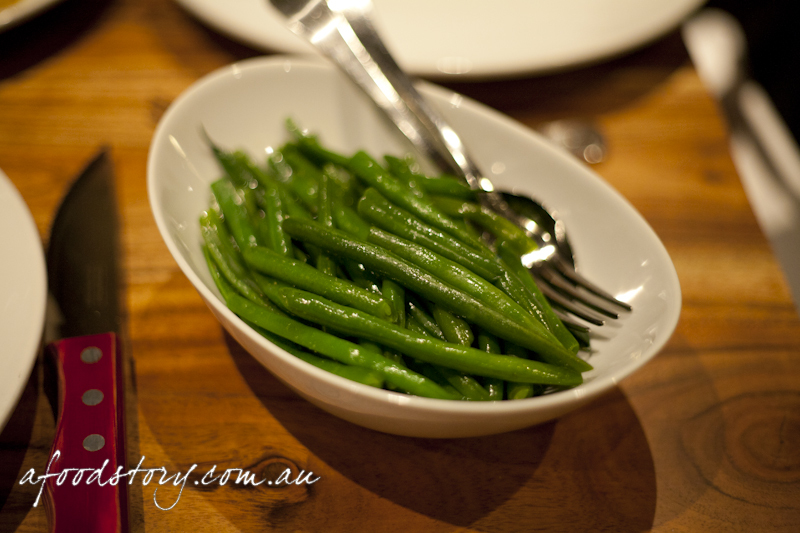 Supercilious, slow staff – we waited for ages for everything from the menu to the bill. At one point we’d been sitting with empty plates for about 20 minutes, when a waitress came by and started clearing the now-vacated table next to us. Not that impressed, in all. Hi Tina – interested to hear what you think when you get there! I had a fantastic experience there. The roasted chicken was delicious, hand cut chips awesome and I can’t wait to go back for another chocolate sundae fix. The service for us was great for the entire meal. couldn’t understand the waitress. food took too long and the guy in the suit was rather rude. first impressions last…wont be going back! Looks like there is mixed reviews so far, especially around the service. Hope they pick up their game and get some consistency happening. 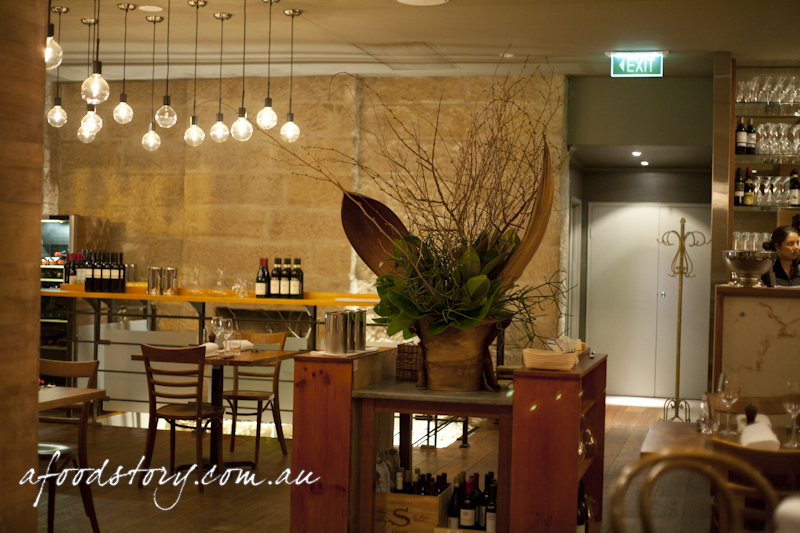 Was a great fan of Balzac, such a great fine dining restaurant so close to home ,great for a special occasion. Having tried The Montepellier House last night must say found it a bit of a let down. The restaurant is just as lovely as you would expect being in the same building. The service a little more casual but still fine, the food was the big difference, it just has lost all its wow factor. The choices on the menu sounded interesting but so underwhelming when presented. The Oxtail platter to share was ok but seriously too many carrots and not enough meat. The potatoes in dripping were average and the apple crumble disappointing. The chocolate sundae was great and the Knickerboker Glory looked brilliant. I will give the restaurant one more try in the downstairs area perhaps but so sorry to see Balzac go and be replaced by something not nearly as good. Shame. Was researching for reviews and found your awesome post. It has pretty much convinced me to make a booking! Ok so having been to the late “Restaurant Balzac” for my birthday this year before the refurb i was quite impressed with The Montpellier Public House. The less formal very laid back atmosphere made us feel very comfortable for the massive feast we were about to eat. My fav was the white onion soup with duck sausage roll & some sort of gizzed. (very strange never thought i would eat such a thing). The piggy & all the trimmings we had were fab very my style carbs carbs & more carbs. 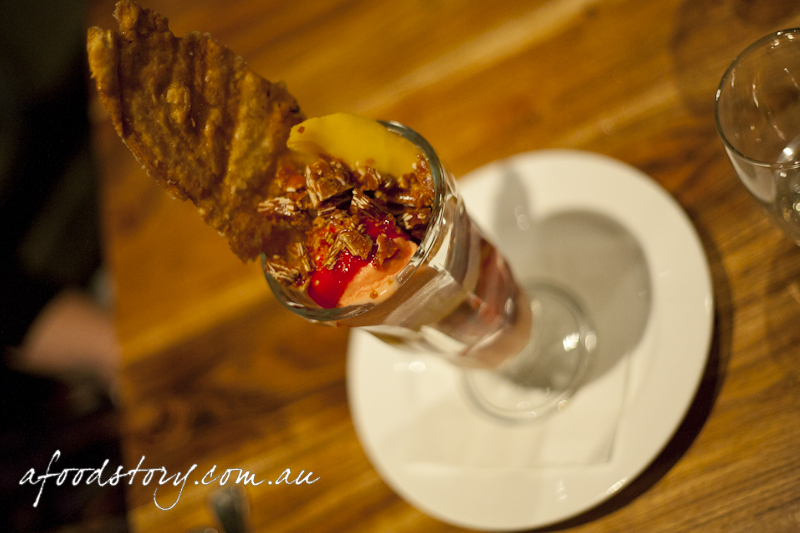 soooo we get to the dessert & wow when that knickerboker glory arrived i instantly thought i was going to be sick. I obviously rolled out the door that night. I am scared of dogs, babies, white bread and now am adding ‘pigs head’ to the list!